Without going on too much about Malta, I would just like to share some news with you all. 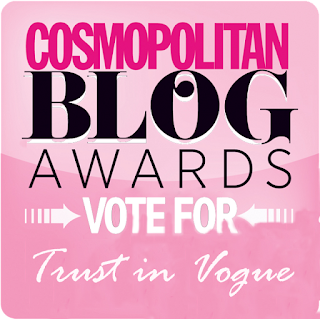 Trust in Vogue has been shortlisted in the top ten for 'Best Newcomer' in the Cosmopolitan Blog Awards! ARRRRGH! I literally screamed, cried, you name it. I just thought, what? really? out of 43,000 entries, my blog got shortlisted! All thanks to you guys, so I would want to say a HUGE thank you to everyone who has voted for me, and supported Trust in Vogue right from the start of last November. If you would like to see Trust in Vogue win the Best Newcomer award, please click on the link below, select TRUST IN VOGUE and submit! It just takes up a second of you time and it would mean the absolute world to me. Once again, thank you so much!! Anyway, without me jibbin' on too much and being a soppy old sock, here are a few holiday snaps for you all to have a nosey at, whilst I get back into the routine of blogging after my long week off! Enjoy! Mixture of rocky and sandy beaches, love it! You can definitely tell i'm the milk bottle of the group! Me being me.. haha! As you can tell, I'm having a really good time on holiday! The beautiful 'Blue Lagoon''! It literally looked so amazing and crystal clear. What do you think to Malta?